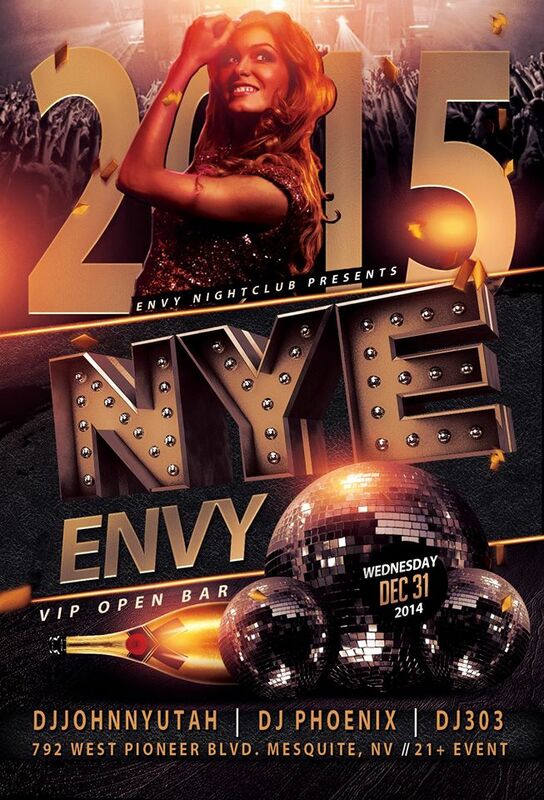 Southern Utah/ Mesquite’s Sexiest New Years Eve Party at Envy Nightclub! Hosted by DJJohnnyUtah, DiskJockey Phoenix and DJ303! Party Starts at 9pm and goes til DAWN! VIP OPEN BAR! VIP OPEN BAR! VIP OPEN BAR! Text Toby for more information and pricing. Its Cheap and its ALL YOU CAN DRINK! VIP OPEN BAR is Only $60 for Ladies and $70 for Guys. They will Sell Out Fast so don’t wait. THATS ALL YOU CAN DRINK FROM 9PM-DAWN! Liquors like Fireball, Skyy, Jack Daniels, Jager and Much More. Dont settle this NYE. Party til Dawn Nevada Style. Tons of FREE Prizes, FREE Glow Sticks, FREE T-Shirts. Come play this NEW YEARS EVE at the Only True Nightclub in between Las Vegas and Salt Lake City. There are a lot of Great Bars but ONLY ONE NIGHTCLUB.